No power? No problem. 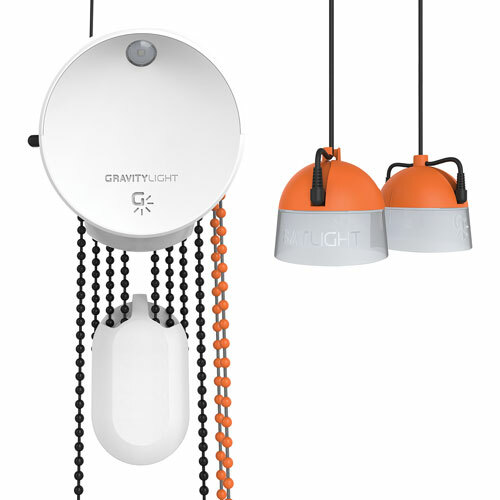 GravityLight produces light from gravity. Yes, gravity. When you're in a bind, out camping, or spending time in the backyard, you can illuminate your surroundings with GravityLight. Simply hang the light, fill the provided bag with weight, hoist up the bag, and be amazed as it creates light on its gravitational descent. I've been following this product for years, since it started as a way to get African communities from depending on kerosene for light at night. The light works great, is nearly silent (which was always a concern) and seems well-constructed. The lights are bright enough in a totally dark room, but not super bright in other situations. They really are a close match for the kerosene panthers they'd replace. We use it in a cottage bunch with no electricity, and it's perfect for reading before bed. And profits go to charity apparently, so hey, everybody wins.